Next time you’re on a train, in a shopping centre or waiting at an airport, take a quick look around. Chances are you will probably see a large majority of people with their heads down over their phone, backs hunched, head tilted forward and shoulders rounded. We are all guilty of spending large portions of our day looking at a screen. 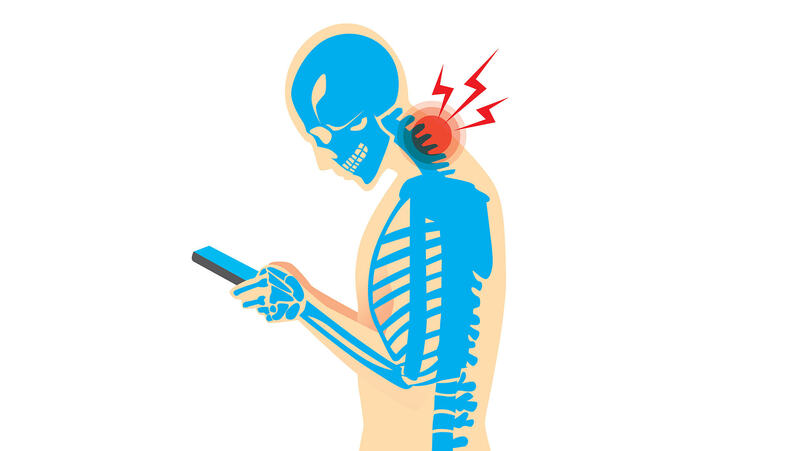 Whether we are scrolling through Social Media, responding to work emails or texting our friends, our back and neck are most probably suffering for it! 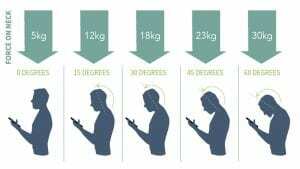 Poor posture as a result of constantly looking down at a screen places a lot of strain on the cervical spine and is becoming an epidemic, it has even been given a name, ‘Text Neck’. Bending your head to look at your phone can add up to 30kgs of extra pressure on your spine! Studies have shown that even a 15-degree head tilt adds 12kgs of pressure, which over time can result in headaches, neck, upper back, shoulder and arm pain. Hold your device up to your eye level, so that your neck does not drop downward. Take regular breaks from your phone and laptop throughout the day, and adjust your seating or standing position. Think about gently tucking your chin in to lengthen your neck when using your device. Roll or shrug your shoulders a few times and stretch your neck in different directions to prevent muscles from becoming tight. Our dentist, Dr Ian, strongly believes in treating his patients holistically. Things like correcting your posture can have a large effect not just on your oral health, but your overall health. To book your appointment with Dr Ian, click here.